While I remain skeptical of Linux’s chances to overtake Windows as the Netbook OS of choice, that isn’t stopping Intel who continue to invest in a Microsoft alternative. The latest version of its own Linux distro called Moblin sees the light weight OS undergo a complete User Interface overall optimized for Netbooks and MIDs that typically sport a 7-10 inch screen. It’s the UI, says Intel, that will be key to Linux’s client-side adoption, and on that note Moblin 2.0 appears to take much of its inspiration from the next generation of smart phones. At its heart are a number of ‘home screens’ that can be switched via a tabbed interface. 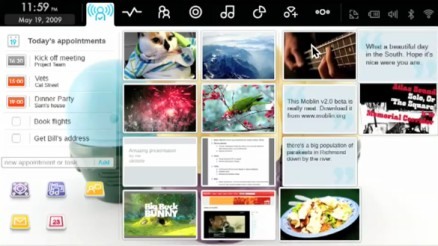 The first offers up a social networking aggregator, giving the user an overview of all their friends’ activities across a range of web services, along with thumbnails of recently accessed files, shortcuts to frequently used applications, and upcoming appointments pulled from Moblin’s calendar app. A second tab enables a user to quickly update their status, although it’s not clear what social network this plugs into (Facebook, Twitter etc.). A third tab goes straight to contacts, including their IM status and email activity, while a fourth tab offers up a browser search bar, history and bookmarks. Next is the media library, which features what appears to be a DLNA client so that you can access photos, music and video stored on an another device connected to the same local network, such as an XBox 360. And finally, there’s a catch-all tab for accessing other applications. I like that phrase: “Up from phones, not down from notebooks”. My sister just bought an Acer Aspire One running Linux (Linpus Lite). I told her it would be different from XP or Mac OSX and might take a bit of getting used to. It's also priced low, and could be replaced in 18 months (less than $200 for a refurb unit). She said: “get used to it like a new mobile phone”. I said, exactly.